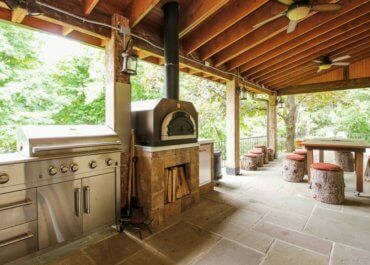 Designing your outdoor kitchen can be an exciting process for every homeowner to experience. 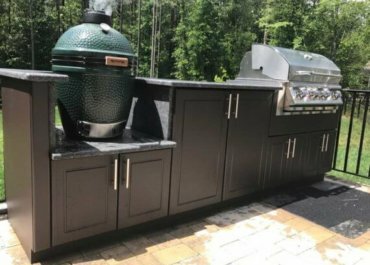 Once you have designed your dream outdoor kitchen, you might also consider selecting the color scheme for the decor. No outdoor kitchen is complete without outdoor decor. Werever Outdoor Cabinets offers 11 color options to complement your decor. To view our color selection, visit our website for more information. 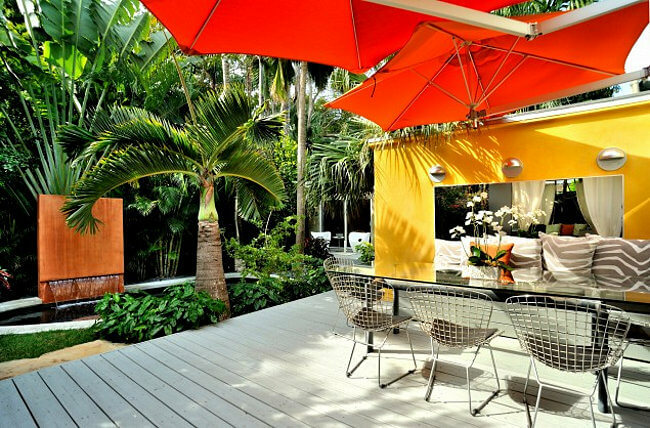 Nonetheless, consider these best outdoor patio color schemes in your next outdoor project. One of the benefits of having dark color furniture is that they require less maintenance compared to light color furniture. This works perfectly for families with smaller children because it makes cleanups easy to tackle. 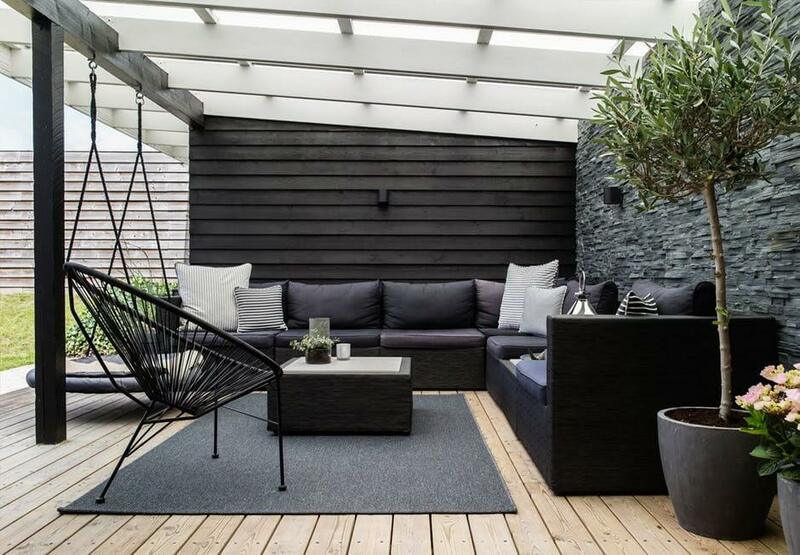 In addition, most dark color furniture has minimalistic characteristics that make it easy to create a minimal outdoor entertainment area. If you find this concept too minimal, try adding rich green plants and colorful flowers to brighten up the area. 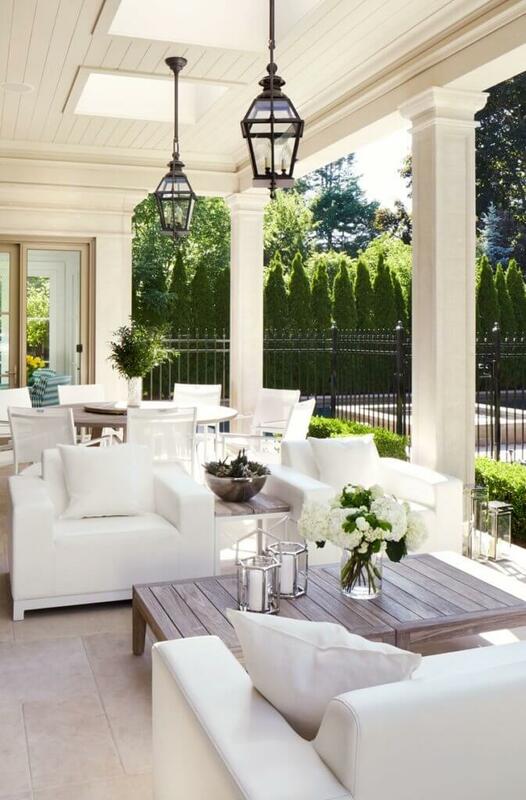 If your goal is to have a calm outdoor space without loud colors, keep it simple by sticking with neutrals. This color palette is quite popular in most households because it makes the decorating process much easier. You are able to create a subtle elegance by mixing grays and neutral tones, patterns, and textures. Consider adding gray throw pillows, ottomans, lounge chairs for a monochromatic color look. 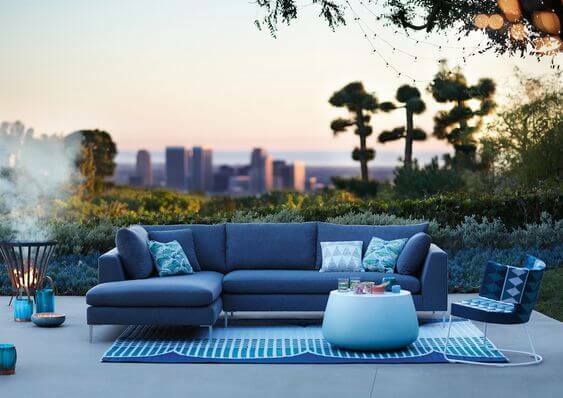 Most homeowners would not invest in white or light color outdoor furniture because they are afraid of the potential damages rain, snow, or harsh weather conditions could cause to their furniture. However, today’s durable fabric technology makes it easy to clean up messes with just a wipe of a cloth. Nonetheless, guests can enjoy eating delicious food and drinking wine without the fear of spilling or damaging furniture. 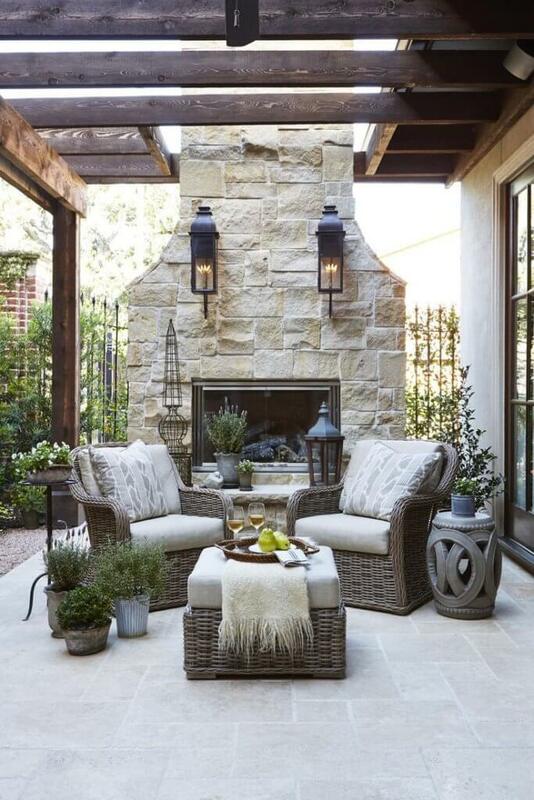 Compliment the light outdoor furniture with rich textures or natural materials like a wood side table, burlap fabrics, basket weave or ceramic planters. Cool greens, purples, and blues make up the color scheme palette known as Cool Tones and there are many advantages to decorating with these tones. They can help create a relaxing environment and have positive benefits for the human body. The deepness of these colors tends to have a “cooling effect” that helps relax the muscles and soothe the mind. Try balancing the decor with a warm color or two. Learn more about creating a calming environment on theSpruce. If you live in an area that does not get much sun throughout the year, small adjustments in paint color can help create your own paradise at home. Bold colors in decor can create an uplifting ambiance and boost mood. Furthermore, If you are not in love with the idea of bold color furniture, consider painting a bold accent wall and add neutral decor to balance out the color scheme. Werever outdoor cabinets are available in 11 colors to complement any decor. The color is solid and goes all the way through the board. The color can’t be chipped or peeled off. The material is UV protected against fading. The color will not chalk as PVC does. This is HDPE! Material colors will vary depending on your screen. Please request a material sample to see the exact color.